"Jenny Lin has been close to Glass at various points in the works' development, but this does not mean that she is obligated to follow his lead in terms of interpretation. Indeed, it's the best possible news for his music that any prescriptions he may have laid down are now being discarded in favor of variety. Lin offers some of the widest dynamic ranges to be heard on recordings of Glass' keyboard and chamber music, Read more and her performances are sweeping and powerful." What a delightful 2 disc CD set this is, and a propitious time to celebrate Philip Glass’s 80th Anniversary year. Philip Glass composed the complete Etudes between 1994 and 2012, many of them for his own personal purposes as a solo recitalist. Glass was busy with composing, and felt he did not have the time to learn Etudes 11-20, which are more difficult to play, so Glass tagged nine other pianists from a variety of backgrounds to join him for the first live performances of all 20 Etudes. Jenny Lin, who is the performer on these discs was among the group selected, alongside Nico Muhly, Timo Andres, jazz virtuoso Aaron Diehl, frequent Glass interpreters Maki Namekawa and Sally Whitwell, and others. The New York premiere took place in December 2014 at Brooklyn Academy of Music. Lin continues to join Glass on the ongoing world tour of the Etudes. Jenny Lin has had a strong impact on the musical scene, noted for her support of modern music. She has appeared at Carnegie Hall, Avery Fisher Hall, The Kennedy Center, the MoMA and the National Gallery of Art. Her performance here is energetic and polished. Some people can only take Glass in small doses, but I’ve always been a fan of his music, and I find it’s a joy to immerse myself in the Glass universe of these fresh performances of the Etudes. The recording was done during four sessions at the Steinway Hall in Manhattan. The acoustics are excellent, and Steinway uses the venue as a showplace for its line of pianos. The recording is a fine one, with a very realistic sound, close enough to hear the details, but not so close as to lose the acoustics of Steinway Hall. Glass is always a composer have strong opinions about, but Glass lovers will cheer this fine recording and performance of these Etudes. Highly Recommended. Lovers of tonality owe a debt of gratitude to minimalism. Classical music became mired in the serial slog of atonality and dissonance in the mid-20th century. Audiences found Schoenberg and Boulez ugly and unlistenable. Along came La Monte Young, Steve Reich and Philip Glass to re-define music as a reduction of the materials a composer uses: harmony, rhythm, dynamics and instrumentation to a state of stasis, or changing very slowly. Repetition becomes the main structural technique. For some it exhilarates and for others it’s an invitation to doze off. It requires the listener to pay attention to “music as a gradual process” (the title of a Steve Reich article defining minimalism). Philip Glass (b. 1937) is the best known of the minimalists because of his prodigious output in many styles (operas, symphonies, movie soundtracks, choral and chamber music), his collaborations with artists in a variety of media, and his lyricism and emotional range. He added Indian music to repetitive patterns, creating a hypnotic sound that became a perfect vehicle for the rhythmic sax and keyboard sound of his own ensemble. Historically, etudes are studies (usually for one instrument) that composers write to provide practice material to increase their technique and musical skills. In some cases, notably Chopin, Liszt and Debussy, they are so well written that they become concert pieces. Glass began writing his Etudes in 1991 as practice pieces and additional concert works for his solo recitals. Book 1 was finished in 2003 and Book 2 completed in 2012. So these works trace the composer’s development over a span of almost 20 years. He decided to concertize “The Complete Etudes of Philip Glass” in late 2014 by conscripting several pianists (as many as 10) from different backgrounds to perform them at one time. One of these pianists was Jenny Lin. While these works present a portrait of Glass’ development as a performer and composer, as a body of works they are both different and similar. Of course, most have repeating patterns, syncopated rhythms and rapid arpeggios. In Book 1, you’ll hear melodies develop with slowly changing rhythmic patterns underneath that can become transfixing (No. 1 and 2). There’s a quiet and intimate aspect here that is beautiful. No. 5 is a contemplative, quiet repetitive exercise that could lull anyone to sleep, perfect before going to bed. The motoric No. 6 ends suddenly. No. 8 becomes richly dramatic through the use of dynamic variance. No. 10 uses speed and motoric repetition that will fascinate some and bore others. Glass describes Book 2 as being less virtuosic and “more about the language of music itself.” There’s an increased complexity in these later etudes that made them more interesting. Etude No. 13 is a study in the drama of ascending and descending scales. No. 14 is quieter and just a shade too energetic to be called reflective. No. 15 reminds me of gentle waves rising and falling, gradually growing in intensity. No. 16 has a thoughtful melody that’s given energy by a playful three note figure. No. 17 is dominated by the more serious lower registers until leavened by a beautiful and pensive melody in the higher registers. The final Etude is derived from Glass’ film score from the movie Visitors and it’s the most interesting and profound of all his Etudes. There’s a searching and vulnerable aspect to it that leaves the listener in a pensive and grateful mood. Since Jenny Lin is one of the several pianists Glass has chosen to play these works with him in concert, I’ll assume her performance is ‘authentic.’ I have heard many of her albums and found them to be brilliant and sensitive. This album is no exception and Steinway’s sound is marvelous. 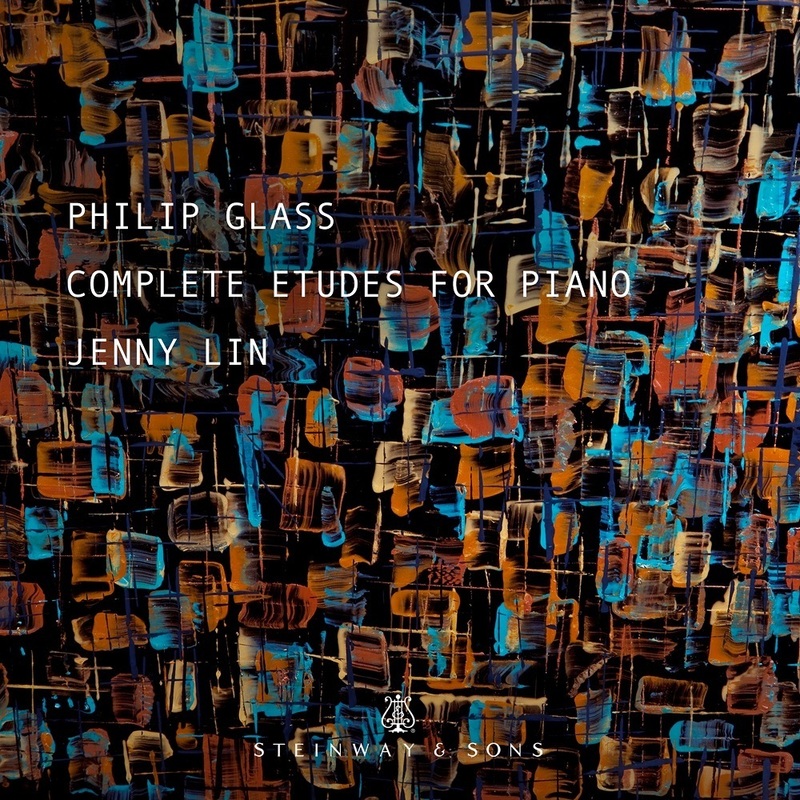 This is a good album to experience the variety and similarity of the music of Philip Glass.